The Phytotitre natural product library is a collection of 800 plant extracts representing 367 unique plant species and 304 unique genera. 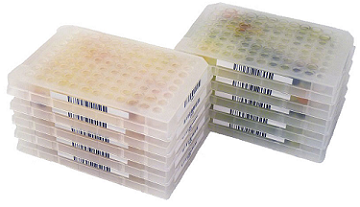 The Phytotitre natural product library (250 µl kit size). 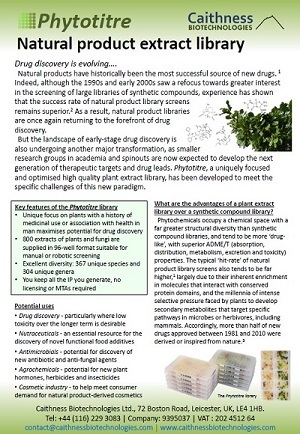 The library has been carefully designed to maximise potential for the discovery of drug leads by including only plants which have a history of oral or topical medicinal use in man, or are foodstuffs which have been reported to be associated with reduced risk of disease in diet-focused epidemiological studies. This strategy is intended to maximise the potential for identification of molecules that may interact with pathways of interest, while at the same time minimising the risk of identifying compounds with excessive toxicity in mammalian systems. The library is made available to researchers in academia and industry for research purposes only. Please click here to download the Phytotitre flyer.